Printed perfect. Nice detail on the stone work. Printing the base with fence now. You make it, we will print...lol. Nice design!!!! My brother in law loves d&d and wanted a tower and this was perfect. I put a little dragon on top for him. Im debating on printing the ruin top. 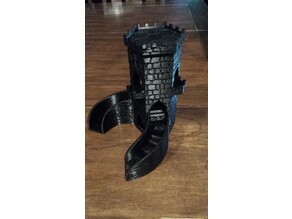 Im printing the 1 piece base now. Even with the leveling snafoo at the start it should be done by morning. So, I modified the stair objects, and I think it will work to keep the dice from injuring bystanders. Let me know what you think.